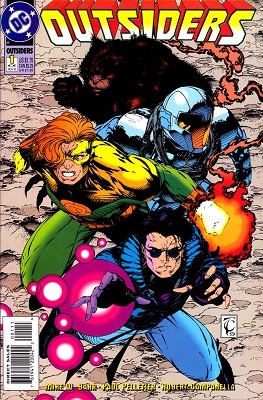 At the request of yaseen101 , some choice Mike W Barr, Alan Davis "Batman and the Outsiders", well... sort of. Since we never really got much post-Crisis Robin!Jason in the first place, and he's more often than not retroactively written as being more of a bad seed than he actually was (stealing the Robin costume in Nightwing Year One vs. being given the Robin costume in Batman 410). Mike W. Barr wrote post-Crisis Jason as closer to his pre-Crisis incarnation, so I was also hoping to see more of an amalgamation of the two, or at the very least something a bit closer to post-Crisis Jason. It was also nice to see a young Jason!Robin not being written as constantly angry, "thuggish", punk-like, etc. It seems like too often many fans, creators and editors forget that Jason as Robin was heroic and did heroic acts. Thankfully, Barr didn't forget. I wasn't all that enthused for the new DC retroactive series, but the description for this one caught my eye. From Detective #569, "Catch as Catscan" the first issue of the sadly short lived Mike W. Barr/Alan Davis run. Just how does this guy ensnare so many to his cause? Well without using brain washing devices? Simple words and reason. This is written by Mike W Barr in 1983, in "old school" mode, which means it's a story with a beginning a middle and an end, "done in one", with no need for angst or ghastly foreshadowing. It's also pencilled by Curt "I probably drew Superman more often professionally than anyone else in HISTORY" Swan so drink it up, it's some goooood stuff! In each issue of the DC scifi anthology "timewarp" Mike W Barr and Tom Sutton would tell these odd stories involving a female character with blond hair who had a fondness for red clothing. They really put her through the sexual/adventure paces. She was never supposed to be the same character,but the always relied on the same formula. B&R is making me reread my old Jason issues. This is from Detective 579, i.e. 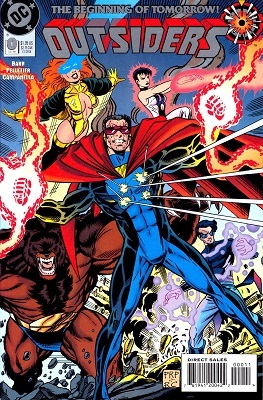 features the Post-Crisis version through Mike Barr's Pre-Crisis-tinted script.